Recently, 1/2 of US patents was granted to foreign residents, whose numbers are at below 1/10 of the US population. This trend has been growing almost monotonically since 1947 and reflects the ever-increasing majority of graduate students in science and engineering, who are foreigners. Foreign graduate students are currently at 80% or so in math and petroleum engineering. The US Patent Office does not count naturalized American patent holders. 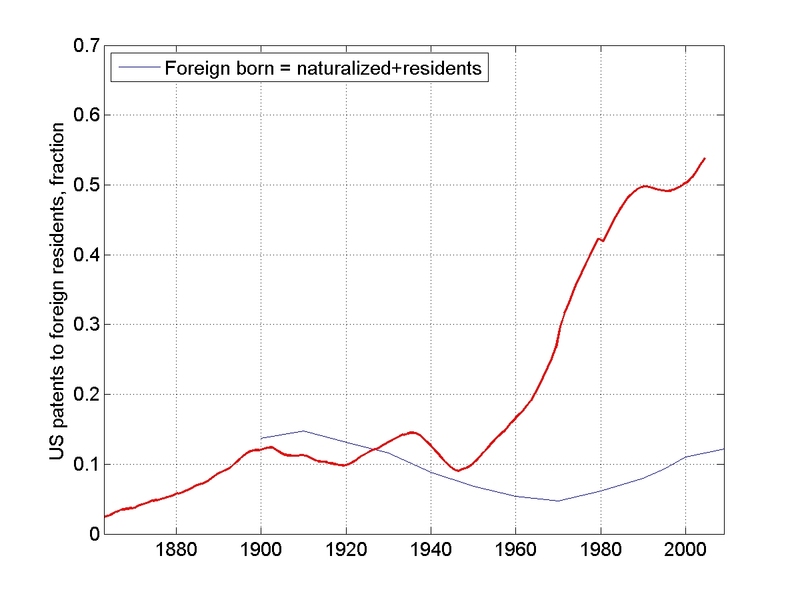 Given that roughly 50% of engineering and science professors are foreign-born, patents given to foreigners in the US dominate. Fraction of all US patents granted to foreign residents. 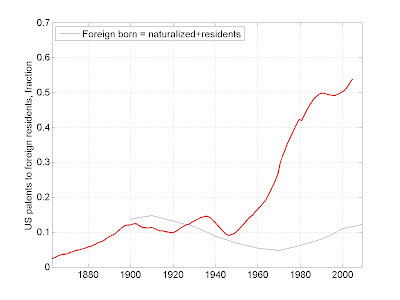 Note that the total foreign-born fraction of US population has hovered between 5 and 15% of the total population. Also note that since 1947 foreigners have received an almost monotonically growing share of US patents that is now at least 5 times their share of the US population. (I say at least, because I am adding naturalized citizens to the foreign fraction, and the patent fraction does not). A steep decrease of patents granted to foreign residents between 1939 and 1946 reflects the WWII effort in which foreign scientists and engineers were quite involved. immigration invention nonresidents patent U.S.
Labels: immigration invention nonresidents patent U.S.